My third, and mostly successful, extermination company came to the house last week. They had to reinforce some of the extensive anti-rat measures they did last June to seal the house from intruders. That previous round of prevention seemed to have worked pretty well. It didn’t appear that I had lost any more appliances, anyway. Through chewing hoses and what-like, the rats had taken out my washer six times, my refrigerator water hoses twice, completely ruined the fairly new dishwasher so it can’t be fixed, and stolen insulation from my antique stove. All that seemed to cease, as I said, after the rat men did their thing last June. Then the furnace man showed up after the rat men left. During the summer when I wasn’t using heat, the rats had chewed holes through all the ducts and built nests—which is why I kept smelling something burning and can’t now use the furnace because of fire danger. I have no heat until the furnace crew comes to replace ducts on Saturday. It’s the busy season for heating folk and they’re working overtime to fit me in. Which I’m paying for, of course. 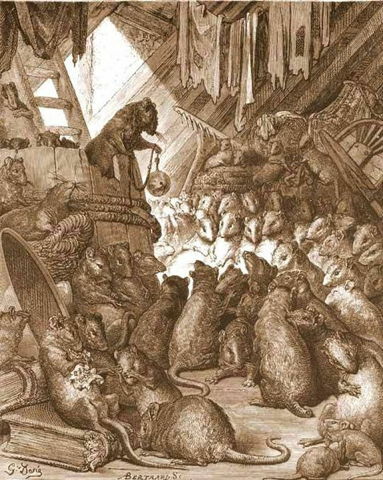 We didn’t used to live in the state of rat siege I’ve experienced in the last couple of years. I didn’t think it had anything to do with magic, but now I’m thinking maybe it did. Rat magic? Spirit of place magic? The magic of persistent and smart vermin and the spells to counter them. Or maybe the magic of my missing mother who died almost two years ago. She said the first time she stepped into this house it welcomed her with open arms. She knew she was home. I believe that. I truly think the house loved her. We had rats when she was alive, but nothing like this deluge and we never lost any appliances to them. My mama had her some powerful mojo, I tells you. I’ve tried the magic of plugging holes with wire mess and solid metal, the magic of rat traps, the magic of cayenne pepper dumped down their holes and liquefied to spray on appliance hoses and the surfaces they frequent, the magic of poison, and now I’ve experienced the magic of my third round of mesh and metal and traps. These vermin are also partial to building rat nests in my bookshelves, consisting of my books and notebooks, taking over my art and craft cabinets–there’s a metaphor I don’t wish to examine too closely. I make sure I lock up every scrap of food at night, which cheeses off the cat. She liked snacking at night. I told her since she decided to retire from mousing, those were the breaks. Before that second round of anti-ratting seemed to save my appliances, I felt pretty desperate. I decided I had nothing left to lose and I’d try some more conventional magic—spells and charms and the like. If nothing else, it was something to make me feel less helpless. Interestingly, rat spells are sparse, at least on the on the internet and in the books on magic I have. Our ancestors probably recognized the futility of trying to get rid of these insistent, persistent, adaptable rodents. I found one candle spell; an ancient Christian amulet which I talked about here; a few references to putting mummified cats in crawl spaces and building foundations to ward off the beasties. One of the more passive aggressive techniques I found entailed writing letters to the rats stating that the eating was much better at the neighbors’ houses and they should go there and leave (my) house alone. The letters are then stuffed down the rat holes. As any fan of Outlander can tell you, this is reminiscent of the Scottish tradition of “rat satires,” improvised songs indicating that they should leave the house alone and go to the neighbors. I am not passive aggressive by nature, nor did I wish to mummify my cat or any other cat, and I felt I needed something quicker than making an amulet. I decided to do the candle spell. I mentioned that I was desperate and wanted something quick, right? The spell had to begin on the night of the full moon at moonrise—and the day I found it was the full moon. I didn’t want to wait another month so decided to use what I had around the house. It called for yellow candles and the only yellow candles I had were about three inches long. You were supposed to run the spell for two hours every night until the candles burnt up. The ones I had probably wouldn’t make it through the first night, but I thought it better than nothing. (First corner cut.) The spell called for a sprig of heather so I confidently went into the front yard and only then realized the gardener had pulled up the heather bush. I quickly looked up the magic properties of heather and realized rosemary had many of the same, so I cut a sprig off my rosemary bush. (Second corner cut.) Moonrise was late that night and I had to get up at 5:45 the next morning for work, so I started the ritual early. (Third corner cut.) About 45 minutes into the ritual, the rats started making an unusual amount of noise in their favorite room, the one where I keep my birds. In general, their behavior was much louder and more aggressive that night. One of them got up on the fridge and scooted down the face of it, knocking off one of the magnets. My magnet portraying the three faces of Hecate. Most of the candles from my ritual burned out after about 90 minutes, but one brave little flame burned on. Just shy of the two hour mark the candleholder for that brave little flame spontaneously shattered. Between the raucous behavior of the rats, the cracked glass, and the Hecate magnet I had a strong suspicion the Universe was telling me something. Maybe to do the ritual the proper way next time. Or maybe Hecate and the rat gods were saying, “I hate dabblers.” I rather thought it the latter. I’ve long maintained that dabbling is a dangerous practice, but I had set aside my principles that night in frustration. Henceforth, I’ve decided it would be better to take my own—and Hecate’s and the rat gods advice—and leave the magic to those who know what they’re doing. The rat siege continues, though it has abated somewhat. I accept that it will continue. Nature always finds a way in where humans wish to keep it out—no magic about that. After all, the rats consider this their home as well. Maybe instead of fighting them I should try propitiating the rat gods? Or maybe the spirit of place, to see if the house will help me as it did my mother. You are currently browsing the archives for the spirit of place	category. WordPress 5.1.1 and delivered to you in 1.097 seconds using 30 queries.